Hi, Welcome. It’s all good news ! So if you want to accelerate your progress to Ind. Entry level, why not sign-up for one of our Pro. Modelling courses now? 167 Euros (190USD equivalent OCT 2017) per month. You get your .wire reviewed by me every 15 days and you will receive : feedback, instruction, tips and advice from me personally. Access to all videos including my ” Private Student Training Videos”. You will build at least 3 complete automotive exteriors. The course also includes an intensive Reverse Engineering module, which required by most employers. ALL my “Elite” students achieve Automotive Alias jobs. 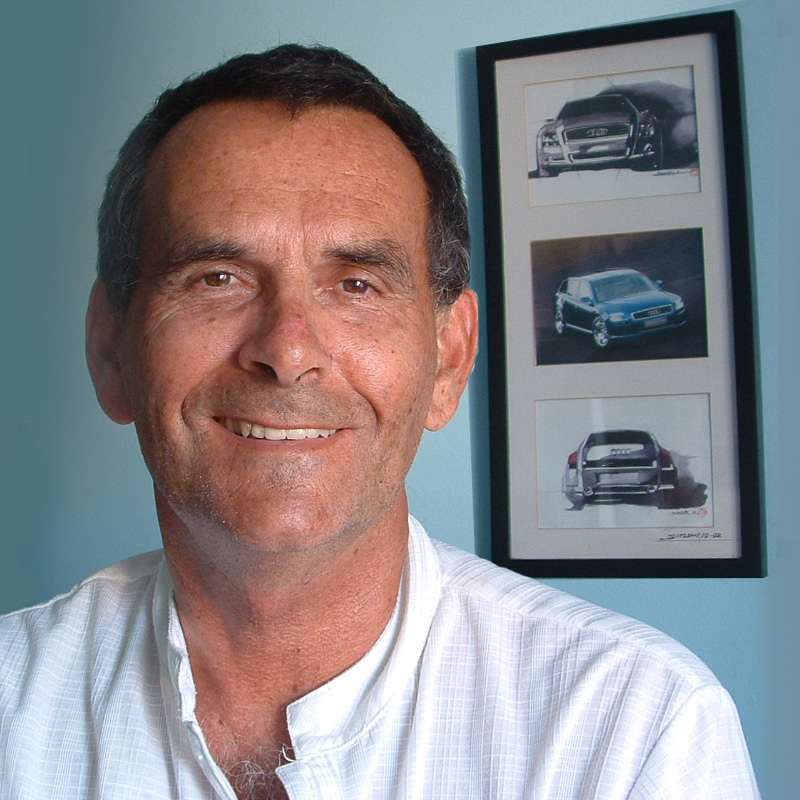 I once worked as an Automotive Clay Modeller and I received a lot of help from very kind people. I am referring to certain individual colleagues, who were older an a lot wiser than me and had the generosity of spirit to use their very considerable knowledge, to help the next generation of modellers, to learn those advanced modeling techniques that the majority simply don’t chose to share. I went on to become a Freelance Modeller and build the first clay model for Satoshi Wada’s 2005 Audi A6 at Audi AG. and the very successful Citroen Berlingo replacement with Sam Brown under Gilles Vidal at Citroen, Paris. I also built the Lamborghini Murcielago wind tunnel model in 2000 at Udelhofen Design. 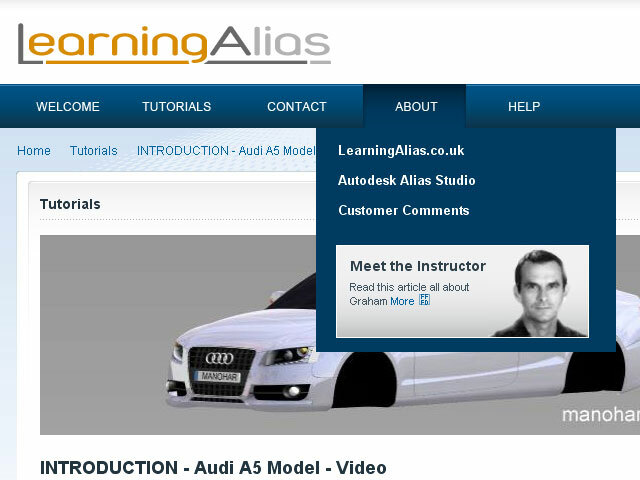 Whilst at Audi I became hooked on Autodesk Alias Studio and was given a lot of help to progress with it by one of Audi’s Senior Designers. I achieved success because I was totally committed and because I had people who were prepared to help me. I had good teachers. I believe in giving back and I do so to people who can demonstrate their total commitment to becoming competent Autodesk Alias Studio Modellers. Students continue to contact me for help in finding Modelling Solutions during their first year in an Industrial Design Studio situation. I offer a unique affordable path for REALLY committed Autodesk Alias students to progress rapidly to becoming Industrially competent CAD modellers. Q. Will your course really get me to Alias Modeller Industry Entry Level? A. Yes! Definitely, if you work hard and have some talent for CAD modelling. I have students who are now working in top companies, such as; Audi, GM, Lotus, Ferrari, Ford, Fiat, Volvo, Nissan etc. Q.What will I build on the course? A. Whether you pay the basic fee to access my 300+ unique video library (fee includes regular reviews and feedback) or you become one of my small group of “Elite” One on One” students, you will be able to build everything you need to have a great portfolio i.e. Q. Will I learn any Reverse Engineering of Mesh to NURBS? Q. How does the course work? A. You receive the Starter Wire and build the model by following my very detailed videos. You send me your wire for review on a regular basis. I supply meshes and sample surfaces where necessary and give notes, comments, tips and advice. Q. Do you hold back on any top Industrial modelling Work Flows? A. No! Students who stay on the course and show genuine passion and commitment, get to learn everything I know about Alias Modelling. Q. If I invest money in your course, how long will it take to recover my outlay? A. Most students recover their total outlay with their first monthly pay check. Q. What will I earn at Alias Automotive entry level? A. Most of my students start on around 6,097USD/5,250 Eur. per month (OCT. 2017). Q. How long to become competent? Q. You are an Alias Consultant/Modeller/Mentor; how do you find time for students. A. I have retired from contract modeling. I work late most nights. A. Yes! I need to see Proof of Enrolment and the discount is up to 35% on Course#2 .Price on application. On the Elite course the discount is up to 35% and students may defer 50% of their fees until they have an Alias Automotive contract. There are BIG discounts for students in emerging economies. Q. Do you work on Sundays. A. I have a family and I quite fancy staying married. and I will get back to you by email with details. Kind regards to all my readers and all the other Autodesk Alias Studio fans out there.